New media are a huge opportunity and challenge for museums, especially for small institutions without digitized resources. The ViMuseo.fi is a research project conducted at the University of Jyväskylä, Finland. The research focuses on the possibilities of new media in presenting cultural heritage in small Finnish museums. As a part of the research, a tool to present small museums on the Web was developed. The ViMuseo tool is a CMS for creating multimedia presentations, and was designed specifically for small institutions without digitized resources. The possible deployment of the tool is also discussed. There are around 1,000 museums in Finland. According to the National Board of Antiquities, there are 157 professionally run museums which are responsible for 329 places open to the public (Kaukonen & Vihanto, 2010). However, according to the Finnish Museum Association, there are around 600 smaller museums, mainly open during the summer (http://www.museot.fi/museoala). Small, local museums are run by voluntary staff and can afford neither to digitize nor to make their collections accessible to a wider audience. The author's preliminary study has shown that the online accessibility and attractiveness of cultural heritage in these small, local Finnish museums is very limited. According to the definition of the museums' sites proposed by Werner Schweibenz (2004), the Finnish local museums' sites present mainly the brochures of the museums, and contain mainly the basic information about the museum. These brochure museum sites are hosted on sites owned by the municipalities. However, the local museums are very eager to use available Internet solutions to present their collections and communicate with their audiences. to construct a tool to create multimedia presentations. to make small Finnish museums more accessible through the Internet. ViMuseo comes from a Finnish word "virtuaalimuseo", which means virtual museum. 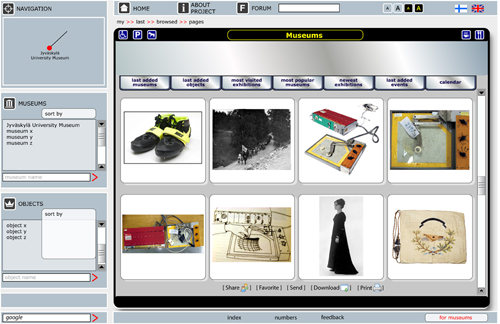 ViMuseo is an online tool to create multimedia presentations, virtual exhibitions and projects. It is designed for the institutions without digitized resources which want to be more active on the Internet. The tool is a content management system, implemented as a Web application (Web CMS). It is developed in cooperation with programmers and graphic designers. The system and its interface are user friendly; its usage does not require any professional knowledge of programming. Users (the institutions' representatives) may register and describe their institutions in a predefined way. They may add objects and use them to create virtual collections, exhibitions and projects. Each object may be constructed by providing a textual description, and adding Google maps, images, flash animations, movies, music files and downloadable files in most common formats. In this way, the user creates multimedia presentations which can be used to create virtual collections, exhibitions and projects. A few examples of social tools will also be implemented and tested (comments, tags and Facebook Open Graph). The study consists of two parts: theoretical study and practical implementation. The theoretical research is focused on new media: how it is used in presenting cultural heritage on the Web and how the possibilities of new media respond to the institutional needs and available resources. The main focus is on small Finnish institutions without huge resources or without digitized resources. 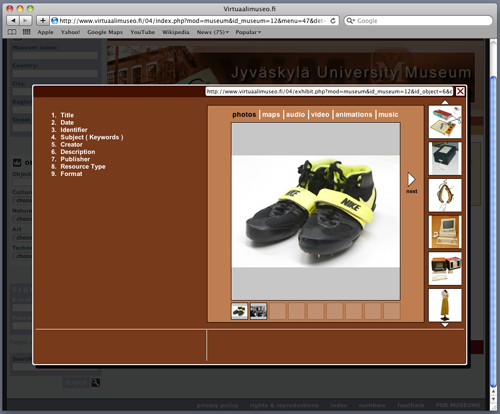 In this project the Jyväskylä University Museum is providing all the necessary material and support. The Jyväskylä University Museum is divided into two units: the Cultural History Section (http://www.jyu.fi/erillis/museo/en/cultural) and the Natural History Section (The Natural History Museum of Central Finland) (http://www.jyu.fi/erillis/museo/en/natural). The Natural History Museum of Central Finland's main exhibition has been open since 2002. The Cultural History Section has been studied in order to provide the necessary basis for the planning and development of the tool to create online presentations and exhibitions. The Jyväskylä University Museum over its 100-year history has been constantly engaged in collecting, preserving, researching and presenting material related to the past and present of the University of Jyväskylä, as well as nature of the Central Finland region. The Museum does not represent small museums; and despite its being a state-owned museum for over 100 years, paradoxically it has not been able recently, as a state museum, to apply for state development resources, like the digitization of its collection (Vilkuna, 2010). However, the Museum is an institution open to innovation and research because of close relations with the Department of Art and Cultural Studies, which includes museology and digital culture studies. The Cultural History Section's collection currently consists mainly of items (36,000 objects; among them also artworks) and photographs (27,000). The main exhibition space of the Cultural History Section is located in the Seminarium Building. The building was erected in 1883, and at that time it served as the main building of the Teachers' College. Between 2006 and 2010, the building and the exhibition were closed due to renovations. At this moment, the Museum's main exhibition is under development and is scheduled to be open to the public in 2013, but some museum objects are presented in several buildings across the campus area. The few online available resources about the collection are limited to 10 representative objects presented in pictures and described in the form of an article (http://www.jyu.fi/erillis/museo/kho/10-esinetta-museon-kokoelmista). Moreover, it has published a number of linear online presentations which include images from the collection (http://www.jyu.fi/erillis/museo/en/cultural/exhibitions/virtual-exhibitions). The Museum has digitized the catalogue, but at this moment it is not available on the Web. Their resources are being constantly digitized. Cooperation with the programmers and graphic designers is analysed in this part (also as a comparative study). In the theoretical part of the research, mainly ethnographic methods are used. A number of museum professionals from the Finnish museums were interviewed, and further interviews are planned. The practical study focuses on ways of presenting cultural heritage objects. In this part the findings from the theoretical study are implemented and the tool to create multimedia presentations, virtual exhibitions and projects is explained. It is designed for the museums without digitized resources, which want to be more active on the Internet. The tool is planned as a content management system and implemented as a Web application (Web CMS). ViMuseo is developed in cooperation with the programmers and graphic designers. The system is being planned as a research project, and as a comparative study has two implementations developed in cooperation with two independent programming teams. In order to analyse this cooperation and develop the system in the most effective way, there are two teams of programmers developing two systems (CMS). The methodology of cooperation within the two teams is almost the same. The same objectives, materials, and ways of reporting were presented to both teams. Despite this same methodology, the final effect and the general workflows differ a lot. This approach is very unusual in this kind of project, but it is bringing promising data and results. Moreover, the different workflow patterns and cooperation levels have resulted in different implemented solutions. In this paper, the basic functions are illustrated by screenshots of these two versions: Version A (http://www.virtuaalimuseo.fi/04) and Version B (http://vimuseo.fi/08). At this stage, both versions serve only research purposes. Even though it may seem that Version A of the system has the features of a ready-to-launch product, it is not intended to be a commercial product. The forthcoming version of the ViMuseo will be published later this year. It is planned as a prototype version which could possibly be developed as a final version serving the museums. In the prototype, the results from the development of both A and B Versions will be implemented, as well as results from interviews with the museum staff and theoretical study. The prototype will present the concept of the system and will get additional comments after demonstrating the system's functions to the museum staff. The development of the prototype is based on both the theoretical research and constant discussion with museum professionals. This will result in a set of procedures and methods which could be possibly used in the final product. The tool is intended for ordinary Internet users. In order to design easy and simple tools, special attention is paid to the graphic user interface (GUI), navigation, and structure of the tool. The system is user friendly and requires only tbasic skills in using Internet applications. These skills generally include browsing, searching, uploading, and using a basic text editor. The process of designing the GUI started simultaneously with the research. The very first propositions were created in order to present the potential tool and its basic functionalities. It was constructed as a multimedia presentation, 'The Helmeted Guinea Fowl' (on CD-ROM and later uploaded to the Internet). The presentation can be viewed (http://vimuseo.fi/fowl). The priorities are simple design and an easy experience for the audience. All the materials, including pictures, text, flash animation and a movie, are easy to access and browse. The structure of the presentation makes navigating through the included elements simple. The design should be as neutral as possible because it cannot draw the attention of the user away. The programming is easy and the tool is open to further modifications and development. The next propositions were focused on the integration of an object with the model structure of the museum site. The model structure was based mainly on a study of the Finnish and international museums' sites (e.g. leading museums in Europe, Canada and the USA). On the basis of this analysis, the set of categories sufficient to describe the institution was proposed. These categories were also one of the issues discussed with the museum professionals. These layouts include a set of tools which are characteristic to museum sites: searching boxes, social media tools, enlarging text, and icons informing about available services. In these layouts, the left and upper side of the window are intended for navigation, searching and other tools. The museum is presented in the inner part of the window. The organization of the window and navigation are not changed. These layouts were presented to the first team of programmers in order to explain the main principles and objectives of the research and design. In the process of constructing the system, the next layouts were created. These proposals also include new features because the system allows for registering many museums. This allows the sorting of objects, museums and exhibitions according to the date of adding items, and their popularity. This set of layout proposals also includes the layouts of an object, exhibition, project and collection. How the particular object should be presented, alone or within an exhibition, project or collection, is still being researched and tested in the process of developing the tool. This is a many-faceted problem and requires further research. However, at this moment both systems have their own and quite satisfactory solutions. On the one hand, the object should be presented as a separate and coherently organized identity, but on the other hand, it should be integrated into the whole site and the museum's activities. The layouts presenting the object and the exhibition/project/collection are very similar. The structure and organization of these layouts is similar. The textual description is based on the Dublin Core set of metadata elements. The object's presentation becomes a separate presentation, similar to the exhibition/project/collections' presentation. Using the same layout for these categories makes them equally important and interesting for the users. The same arrangement of related items makes browsing easy and predictable. The internal part of the window is divided into three areas: the left part is intended for images, maps and graphics; the middle part is intended for text; and the right part is planned for the objects, links, files and other materials. The institution may register and create its own institutional profile. The institution's representative can use readymade templates to describe the institution and its activities, and to create virtual projects, collections and exhibitions. The templates are simple and consist mainly of text boxes (text input fields), check boxes or uploading boxes. These tools are widely known and are easy for ordinary Internet users to use. All the data is optional, and if it is not provided, it is not displayed on the front side of the system, which is publicly seen by all the visitors. Info: detailed information about the institution, visiting and postal addresses, e-mail address, phone numbers, etc. Events: different types of events, workshops, and lectures, etc. In addition to the textual description, each category allows the adding of images, localization on Google maps, and other files (audio, video, flash animation and downloadable files). The object template is organized in the same way as the institution template. The object template includes text fields based on the Dublin Core metadata elements: Title, Creator, Subject, Description, Publisher, Contributor, Date, Type, Format, Identifier, Source, Language, Relation, Coverage, Rights. Different types of files might be added: images (which have their own description), audio, video (embedding videos from YouTube), flash animation and downloadable files. The organization of the object template is still being researched. Possible changes include further integration of the object with the museum, its activities and social tools. There are also basic social tools, like commenting, tagging, adding to favourites, sharing on social services, etc. The user can add objects and then attach them to the main categories from the right brown sidebar: Collections, Exhibitions, Projects, Events, Donors and Community (implemented in Version A). However, the administrator may add this feature to all categories so the objects may be attached to all the categories. This feature does not occur in the studied sites and will be tested with the museums. Displaying objects in such categories as collection and exhibition came from the traditional, real museum. For a long time a museum's site has been more or less a strict representation of the real institution. Its organization was directly translated into the language of the contemporary site. The possibility of adding objects to new places, where they do not traditionally belong, is giving a new perspective to museum practice and to the museum site. The object is getting a new dimension, and it redefines the role of the object. For example, the museum can display objects in the 'Donors' category to show the donors and the donated items. Adding objects to the 'Recommended Tours' can enhance the experience of the site's visitors, encouraging them to visit the real museum or just making them curious about a certain subject. This feature lets the museum reconsider what the object may be and how it may be described. It does not have to be the real object from the collection. From a practical point of view, it may be anything; for example, a person. This makes us reconsider the meanings of collections, museum objects and virtual museums, and redefines these terms in relation to the museum's site. At this moment, the way of presenting the object is still being researched. The object should be presented in a coherent way. The resources used to construct the presentation must be fully integrated with the whole museum site and its activities. Moreover, the template should be universal enough to serve different types of objects. The object may be constructed of many different elements which must be interrelated. Creating virtual exhibitions, projects and collections is perceived in this project as a crucial issue. The collection/exhibition/project's template has title, data, author/curator and description text fields. In addition to this, images might be added, localization on Google maps, and files (audio, video, flash animation and downloadable files). The created objects can be added to the collection/exhibition/project templates. Further development of the object template will also bring possible changes to this part of the system. In order to enhance social interaction within the system, a set of additional social media elements will be implemented in the first stage of the development. The selection of tools is limited to the most researched and popular: social tagging, commenting and forum. Social media might be used on two levels: on one level, between the museums and their audiences, and on the second level, between museums. Future development includes creating communities and crowd sourcing. However, taking into consideration the size of local museums, basic elements are considered as an adequate solution. 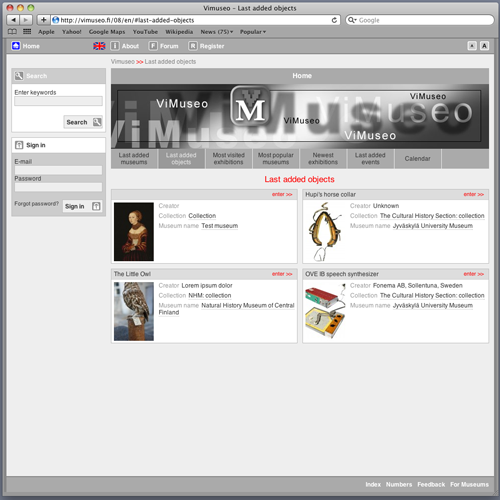 On the main page, registered museums are displayed together. On the main page, the following categories are presented: Last added museums, Last added objects, Most popular objects, Most popular museums, Newest Exhibitions, Last added events, Most popular tags. Presenting museums together may enhance not only the visitors' experience, but also the museums' representation. As preliminary analysis of the interviews with the museum professionals indicated, following other institutions is very important for museum staff and results in adapting observed solutions to their own institutions. Each museum can create its own online display, which is presented in the inner part of the layout. This solution was chosen in order to allow for parallel publishing (optional feature). A particular museum may be published together with other museums in the system and become a part of the larger community, and also be published independently on the Web; for example, on the municipality's site. This feature will be implemented in a final version. In order to make it simple, in the version published on the municipality's site, some tools, like commenting and tagging, will not be active. The development of this system and its deployment in Finnish museums is possible if many problems are solved. As experience has shown, from a technological point of view, the development of the system should not be challenging. The development is not focused on finding unique technological solutions, but on using tested and simple solutions. Using external resources is also an option, like embedding movies from YouTube. According to the philosophy of this project, the use of open source solutions is prioritized. Open source technology is widely recommended in Finland, for example in public administration organisations (Julkisen hallinnon suosituksia, 2009), and can possibly result in user innovations. It seems that small museums are very interested in adopting this kind of tool. The advantage of this tool is its simplicity and openness even to institutions without digitized materials. Its simplest version is a well-structured museum site. It is required neither to add objects nor to create presentations. Consequently, the museum, as an institution, does not have to face extreme change. The work input does not have to increase, because neither constantly updating nor interaction is necessary. The small museums are run by volunteers, and there are not sufficient resources to create expensive Web solutions. However, they have some skills which can be utilized. Moreover, the tool gives an opportunity for museums to interact with their audiences and other museums. It can be a small step in the direction of digitization and a more sophisticated online presence. Many of the studied Finnish museums' sites were created in the early '90s and have not been updated since then. Many national digitization projects do not take into consideration small, volunteer- run institutions. There is a risk that a large part of Finnish cultural heritage will not be sustained. I argue that the lack of tools designed for small museums may result in excluding them from the digital world. Fortunately, in 2010 the Finnish Ministry of Education and Culture appointed a working group to develop the performance of foundation museums, association museums, municipal museums, local history museums and special museums. The development project aims at improving the functioning of local museums, raising the local museums' potential opportunities for strengthening regional and local cultural heritage, and increasing cooperation among museums (Opetus- ja kulttuuriministeriö, 2010). From a museum point of view, I see every town, village, landscape, country and even continent as a Great Museum in which everyone can discover their own roots and see how they fit into the chain of human activities which stretches back over the centuries. According to Hudson, the museums' main function is to increase and enrich people's understanding of the world outside and around them, of the Great Museum (Hudson, 1993). The concept was later imported to Finland and used in the Museum 2000 programme (Vilkuna, 2003). By using new tools, the concept of the Great Museum can be implemented in the digital environment. Using new technologies; for example, GPS technologies, can make local destinations more accessible and attractive for wider audiences. The Internet is giving enormous opportunity to heritage institutions, but digitizing collections is not the only way to strengthen local heritage. If many problems are solved, the ViMuseo.fi can potentially be developed as a working system serving local museums without digitized resources. ViMuseo is still a work in progress. The research is focused on practical and theoretical issues considering the wide and quite new area of digital heritage studies. In the theoretical part of this research, the relatively small museums and their sites were studied, as well as state-of-the-art Internet solutions to present cultural heritage. Evaluating the possibilities of applying them in the Finnish context is also a part of the research. The practical part is designed to implement the findings from the theoretical research and to evaluate the cooperation between the agents involved in the project. The ViMuseo.fi project is a non-commercial project, planned for the purposes of this research, and thus, is proposing an innovative approach to this field. The goal is to design and construct a user-friendly and simple tool to create multimedia presentations, virtual exhibitions and projects. Innovative solutions and a new approach to this discipline let us reconsider many concepts from the museology discipline. The deployment of the tool is considered a huge challenge. However, the tool is designed in a way that even the smallest museums can use it and improve their own online presence. It can be considered as a step in the direction of digital inclusion. The research is supported by the grants from the Department of Art and Cultural Studies, University of Jyväskylä, Finland. This project would not be possible without the help of many people and institutions. Special thanks go to Professor of Museology and Museum Director Janne Vilkuna (Jyväskylä University Museum), Professor of Digital Culture Raine Koskimaa (Jyväskylä University), Chief Curator Pirjo Vuorinen (Jyväskylä University Museum), Anna and Kazimierz Sita (the authors of the Helmeted Guinea Fowl) and to all museum professionals I interviewed. Hudson, K. (1993). "The Great European Museum". Nordisk museologi 2/1993, 51-60. Vilkuna, J. (2010). "Suomen museoalan organisoituminen 1945-2009". In S. Pettersson & P. Kinanen (Toim.) (2010). Suomen museohistoria. Helsinki: Suomen Kirjallisuuden Seura, 27-46. Copyright © 2011 - Archives & Museum Informatics.